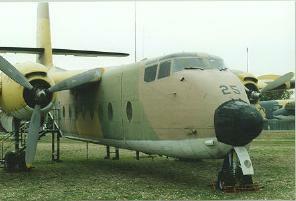 The Spanish Air Force bought 12 new DHC-4A aircraft in 1968/69. They were assigned to the 37th Transportation Wing and operated with 371 and 372 squadrons replacing the Douglas C-47. 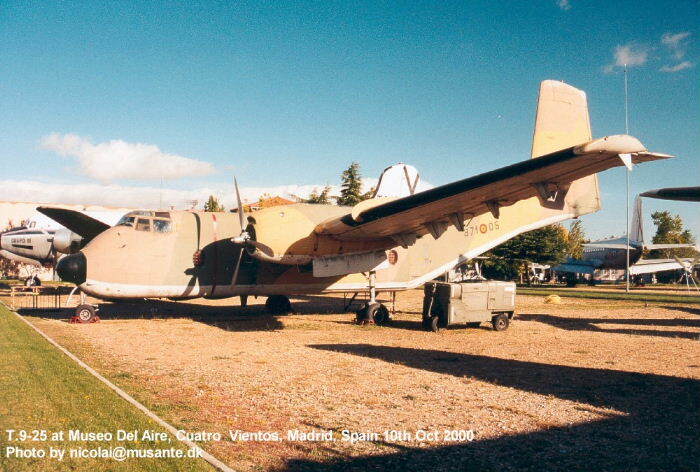 With the DeHavilland production line closed in 1973, 18 surplus USAF Caribous were sold to the Spanish Air Force in 1981. The Spanish Caribous were withdrawn from service by June, 1991. DHC-4A 258 1968 T9-1 new 372-01 Renumbered 37-01 (1988); taken out of service 6/91; sold to INDRA BDE converted to firefighter aircraft EC-GQL; for sale 10/99. DHC-4A 259 1968 T9-2 new 372-02 Renumbered 37-02 in 9/88; taken out of service 6/91; stored at Villanubla 6/91; stored at Cuatro Vientos 11/91; sold to New Cal Aviation Inc. 1994 as N82NC. DHC-4A 261 1968 T9-4 new 372-04 Renumbered 37-04 in 9/88; taken out of service 6/91; stored at Cuatro Vientos 11/91; sold to New Cal Aviation Inc. 1994 as N51NC. 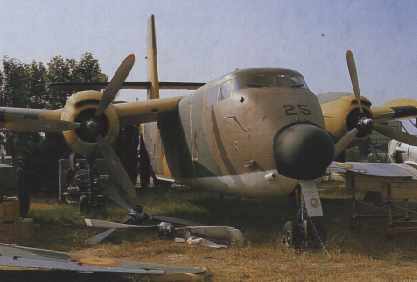 DHC-4A 262 1968 T9-5 new 372-05 Renumbered 37-05 in 1987; taken out of service 6/91; stored at Cuatro Vientos 11/91; stored Maestranza Aerea, Madrid; status unknown at this time. DHC-4A 263 1968 T9-6 new 372-06 Renumbered 37-06 in 1988; taken out of service 6/91; stored at Cuatro Vientos 11/91; sold to New Cal Aviation Inc. 1994 as N53NC. DHC-4A 284 1969 T9-7 new 372-07 Renumbered 37-07 in 9/88; stored Cuatro Vientos as 372-07; taken out of service 6/91; stored at Cuatro Vientos; sold to New Cal Aviation Inc. 1994 as N84NC. DHC-4A 286 1969 T9-8 new 372-08 Renumbered 37-08 in 2/89; taken out of service 6/91; stored Villanubla; sold to New Cal Aviation Inc. 1994 as N86NC. DHC-4A 287 1969 T9-9 new 372-09 Renumbered 372-09 in 5/82; 37-09 in 9/88; taken out of service 6/91; stored Cuatro Vientos 11/91; for sale 4/13/00. DHC-4A 288 1969 T9-10 new 372-10 Renumbered 372-10 in 5/83; 37-10 in 10/88; taken out of service 6/91; stored Maestranza Aera, Madrid; for sale 4/13/00. 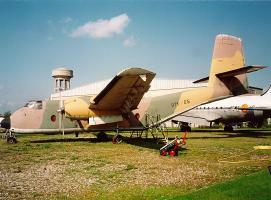 DHC-4A 289 1969 T9-11 new 372-11 Taken out of service 6/91; sold to INDRA BDE aircraft numbered EC-GQM; for sale 10/99. DHC-4A 290 1969 T9-12 new 372-12 Renumbered 371-02 in 5/83; replaced as 371-02 by T.9-14 in 5/86; renumbered 37-12 in 2/90; taken out of service 6/91; sold to INDRA BDE aircraft numbered EC-GQN; for sale 10/99. 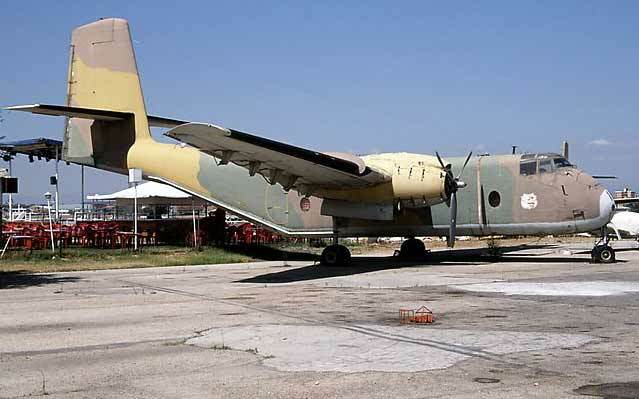 C-7 15 10/81 T9-13 60-3764 353-13 Taken out of service 11/86; sold to New Cal Aviation Inc. 2/88 as N555NC. C-7 17 10/81 T9-14 60-3766 353-14 Renumbered 371-02 in 5/86; replaced T.9-12 as 371-02 in 1987; renumbered 37-14 in 10/88; stored at Villanubla; status unknown at this time. 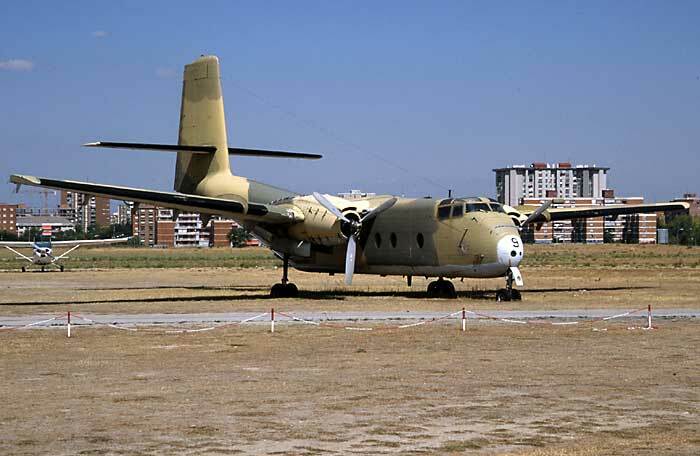 C-7 19 10/81 T9-15 60-3768 353-15 Crashed 10/11/84 at Cabaneros, Ciudad Real Province, after in-flight engine fire. 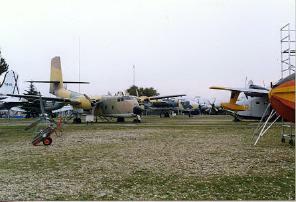 Only Spanish Air Force Caribou lost in 23 years of service. C-7 26 10/81 T9-16 60-5435 353-16 Renumbered as 371-03 in 5/86 replacing T.9-23; 37-16 in 7/87; sold to New Cal Aviation Inc. as N52NC. C-7 38 10/81 T9-17 60-5444 353-17 Taken out of service 1985; sold to New Cal Aviation Inc. 11/86 as N88NC. C-7 49 10/81 T9-18 61-2391 353-18 Renumbered 371-04 in 2/86 replacing T.9-24; renumbered 37-18 in 9/88; sold to New Cal Aviation Inc. 1994 as N54NC. C-7 61 10/81 T9-19 61-2400 353-19 Renumbered 371-05 in 2/87; renumbered 37-13 in 1988; sold to New Cal Aviation Inc. 1994 as N55NC. C-7 133 10/81 T9-20 62-4190 353-20 Renumbered 371-06 in 2/86 replacing T.9-26; renumbered 37-17 in 5/87; sold to New Cal Aviation Inc. 1994 as N56NC. 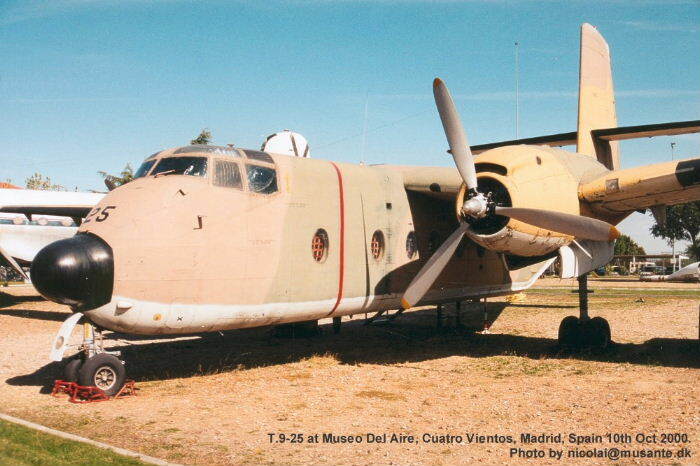 C-7 22 6/82 T9-21 60-5432 353-21 Taken out of service 1985; scrapped - Maestranza Aerea 1988. C-7 72 6/82 T9-22 61-2594 353-22 Renumbered as 371-07 in 5/86 replacing T.9-27; 37-15 in 7/87; sold to New Cal Aviation Inc. 1994 as N57NC. C-7 14 6/82 T9-23 60-3763 371-03 Replaced as 371-03 by T.9-16; again 371-03 in 1987; preserved on parade grounds at Villanubla AFB. C-7 24 6/82 T9-24 60-5433 371-04 Replaced as 371-04 by T.9-18 in 5/86; taken out of service 1986; sold to New Cal Aviation Inc. 11/86 as N90NC. 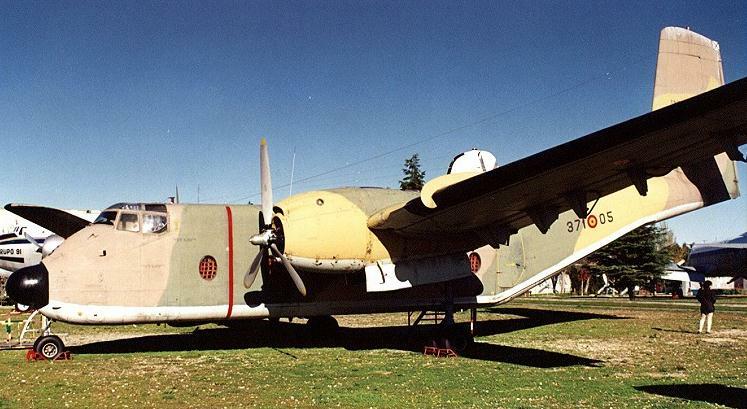 C-7 53 6/82 T9-25 61-2394 371-05 Taken out of service 2/86; on display at Museo del Aire , Madrid, Spain. C-7 27 9/82 T9-26 60-5436 371-06 Replaced as 371-06 by T.9-20 in 2/86; taken out of service 1986; sold to New Cal Aviation Inc. 2/88 as N666NC. 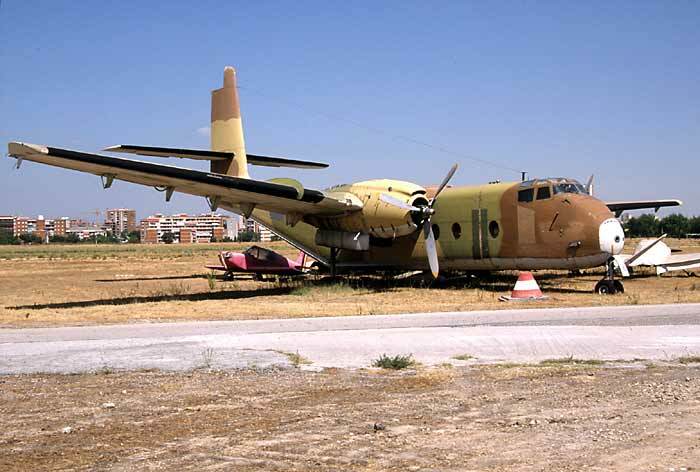 C-7 47 9/82 T9-27 61-2390 371-07 Taken out of service 1987; scrapped - Maestranza Aerea, Madrid, Spain. C-7 58 9/82 T9-28 61-2398 371-08 Taken out of service 1987; sold to New Cal Aviation Inc. 2/88 as N888NC. C-7 135 9/82 T9-30 62-4191 371-10 Taken out of service 9/85; sold to New Cal Aviation Inc. 11/86 as N95NC. When Cor van Gent was guided around at Villanubla-Vallodolid on 23 September 1988 the guide (pilot) takes him to a spot near the runway. One of the based aircraft will make some overshoots for the occasion. After a while a Spanish Caribou appears at relatively high altitude, intending to start the private airshow with a dive. Even before the plane fully recovers from the dive the guide starts cursing and yelling in fluent Spanish and a few seconds later surprised Cor understands why. 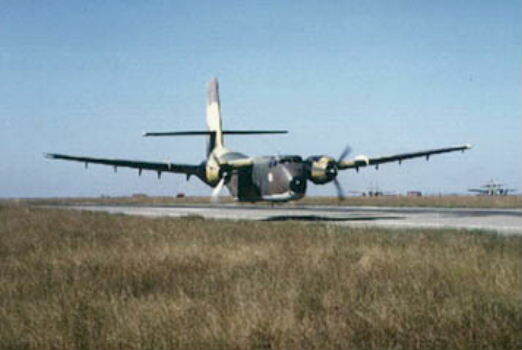 The Caribou is losing much too much height and its pilot only just succeeds in keeping it in the air. The eventual outcome was not only a very spectacular picture, but most probably also blood, sweat and tears for the crew.